Mountain View Correctional Institution opened in December 1998 as a private prison owned and operated by Corrections Corporation of America. On October 1, 2000, the former Department of Correction assumed operating control of the prison, and the state later purchased the facility from CCA. Mountain View Correctional Institution has been designated to accommodate adjudicated adult offenders in a single-cell setting, a segregation unit and an Intensive Control unit. May through August -- A-G: Sunday, 1 - 3 p.m.; H-M: Saturday, 1 - 3 p.m.; N-Z: Sunday, 8 - 10 a.m.
September through December -- A-G: Sunday, 8 - 10 a.m.; H-M: Sunday, 1 - 3 p.m.; N-Z: Saturday, 1 - 3 p.m.
Special Visits for Regular Population Offenders: Offenders who are housed in the regular population may request special visits. Approval or disapproval for all special visits will be based on the security needs of this facility. Special visits may be requested for attorneys, clergy and immediate family. Special visits must be arranged at a minimum of 24 hours in advance and no more than eight days in advance. They occur Monday through Friday between 9 a.m. - 3 p.m.
Special visits for family purposes are expected to occur during regular visitation; therefore, special visits are only authorized every 90 days. Requests for a special visit must be approved through the administrative secretary. Visitation will not occur on holidays unless approved by the prison superintendent. Segregation Offenders: Offenders who are assigned to segregation status or pose other identified security concerns will receive visits by appointment only in the non-contact visitation area. These visits must be approved by the segregation supervisor and have a maximum duration of one hour and will occur between 9 a.m. - 3 p.m. Monday through Friday. Offenders housed in segregation will receive no more than one visit per week. From Raleigh and points east, take Interstate 40 West to Marion (Exit 86). At Marion, take Hwy. 226 North toward Spruce Pine. Follow 226 North into Spruce Pine and turn right onto Hwy. 19E. Go four miles then turn right onto Amity Park Road. Mountain View Correctional Institution is on the left. From Asheville and points west, take I-40 East to the Marion/Spruce Pine exit (Exit 86). Go North on 226/221 through Marion. When the road splits, follow 226 North to Spruce Pine. At the intersection of 226N and 19E, turn right at the stoplight. You will go approximately four miles. Mayland Community College is on the left and approximately ½ mile past the exit you will turn right on to Amity Park Road. 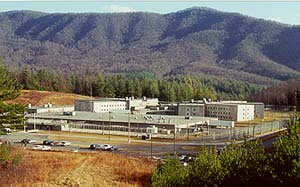 Mountain View Correctional Institution is on the left.